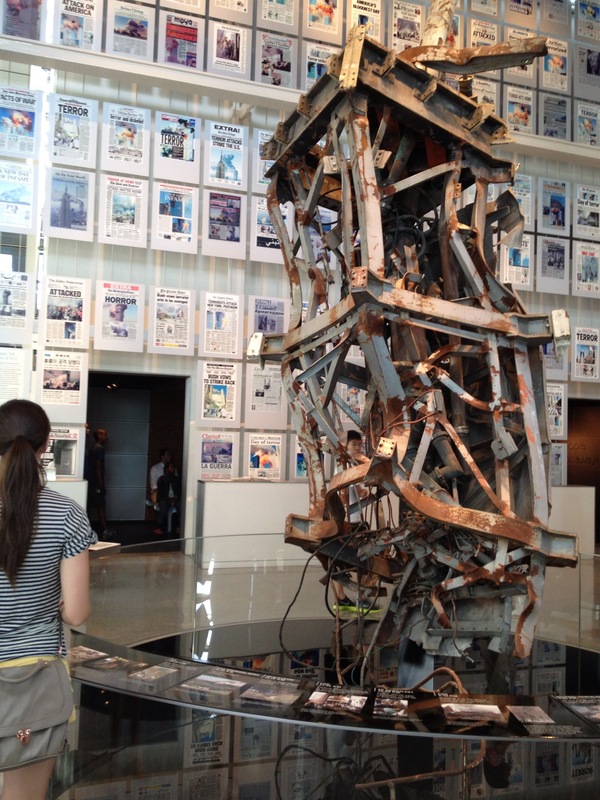 This twisted antenna from one of the World Trade Center towers is enshrined in The Newseum in Washington, DC. Today it’s 11 years. That number 11 will never mean the same thing. As with Kennedy’s assassination, anyone who was alive on the day of the Sept. 11 terrorist attacks will remember exactly where they were when they first heard the news. It was a turning point for our nation’s history and our personal histories. Does anybody remember the way we were, before that day? The time when the process of flying was more carefree, when we didn’t have to take off our shoes or watch what we say? When the top floor of a skyscraper was the perfect place to survey the swath of a great city? When we could descend into a subway without thinking “what if…?” When the rare news of a bombing somewhere didn’t cause us to jump to the conclusion that the bomber was swarthy and bearded? During our recent trip to Washington, DC, we visited the Newseum, one of the city’s most intriguing museums, which depicted U.S. history’s most memorable news stories in artifacts and news clips. An entire exhibit was devoted to Sept. 11, and included the twisted needle from one of the twin towers, the destroyed engine from one of the doomed planes, half-incinerated cellphones found in the wreckage, a wall of front pages from Sept. 12, and videos that re-broadcast news from that horrific day. It brought home the terror of watching it live; seeing the second plane come out of the blue and strike the second tower; hearing the news about the planes that struck the Pentagon and crashed in a Pennsylvania field; experiencing the horror of seeing the stately buildings crumble into ashes; and, in the days that followed, seeing photos of the desperate people who plunged to their death instead of staying behind in the inferno. Today we take the inconveniences of flying in stride. We don’t joke when we wait in line for the baggage screening. We put up with the Patriot Act and the increased scrutiny of our cell phone calls and web site visits. The acute worry of those post-911 days has become a dull resignation: this is the way the rest of the world lives, after all. The New York Times reported this morning that many communities near New York are scaling back their 911 remembrances, especially since the 10-year anniversary passed one year ago. They feel it’s time to move on. But 11 years after that terrible day, it’s still hard to remember the way we were without feeling some regret. My son Ryan and I had visited the World Trade Center in May of 2001. We can remember standing on the observation deck, looking at the antenna that beamed signals around the exciting metropolis that lay around our feet. While guards still were on duty in the lobby, we did not feel vulnerable. We did not feel even vaguely uncomfortable in the company of fellow tourists from exotic lands who did not look at all like us or speak English. From the top floor of the tower we visited a souvenir shop, bought mugs imprinted with the towers’ image; and made a short video to email home. Little did we know, as we stood atop that more carefree world, how little time we had left.